Insurance for Uber and Lyft drivers — on top of those companies’ coverage — is the best way to be fully covered on the job. Often called rideshare insurance, these hybrid policies include coverage for personal auto use and for the times drivers are signed in to a ridesharing app, but not covered by Lyft’s or Uber’s insurance. For more information on these companies, use the links in the first column to visit our reviews. *USAA is available only to active military members, veterans and their families. See star ratings and how these companies and other insurers stack up in our 2019 Car Insurance Company Rankings. Additionally, if you have Uber insurance or Lyft insurance, coverage is minimal while you have the app on and are waiting for a request — known as Period 1. Fuller coverage kicks in once you’ve accepted a ride and are carrying passengers. Period 0: App is off. Your personal policy covers you. Period 1: App is on, you’re waiting for ride request. A personal policy without ridesharing coverage doesn’t cover you. Uber and Lyft insurance limited to liability coverage. Period 2: Request accepted, and you’re en route to pick up a passenger. Your rideshare employer’s policy is in full force. Period 3: You have passengers in the car. Your rideshare employer’s policy is in full force. $50,000 bodily injury per person. $100,000 bodily injury per accident. Up to value of your car if you also have comprehensive and collision coverages on your personal policy. What if my area doesn’t have rideshare insurance? Rideshare policies aren’t available everywhere. If you can’t get rideshare coverage, you would need a commercial insurance policy to be fully insured and avoid being dropped by your carrier in the event of an accident. These plans have higher liability limits than a typical policy — and higher prices to match. According to insurance agent group Trusted Choice, the average commercial policy for a passenger car costs from $1,200 to $2,400 a year or more. A policy with ridesharing coverage costs up to $15 more a month, according to insurers’ websites, although some say it’s much cheaper. For example, Allstate says coverage can be as cheap as $15-$20 per year. State Farm, on the other hand, says its rideshare policies typically cost 15%-20% more than a personal auto policy without rideshare coverage. Not all insurers share estimated rates, but here’s a snapshot of some that do. *Pricing according to insurers' websites. **USAA is only available to military, veterans and their families. Allstate $15 to $20 per year. Erie $9 to $15 per month. Mercury Starting at about $6 per month. Safeco Likely under $10 per month. State Farm 15% - 20% of premium. USAA** Starting at $6 per month. Note that rideshare insurance is either a hybrid policy or an add-on from your personal auto insurer, not stand-alone coverage. For example, you can’t have Progressive for your personal auto policy and buy rideshare insurance from Geico. Tell your personal auto insurer you’re driving for a ridesharing company. Figure out the gaps between your personal policy and your rideshare company’s policy. Uber and Lyft both provide $1 million in liability coverage for drivers carrying passengers. Among smaller and newer companies, policies can vary. Ask your current insurer whether it offers rideshare insurance to fill in coverage gaps, or to quote you a commercial policy, if not. What happens if you have an accident while driving for Uber or Lyft? If you cause an accident during Periods 2 or 3 — while you’re carrying passengers or on your way to a fare — both Uber’s and Lyft’s insurance policies will cover medical expenses and other damages you cause up to $1 million. The $1 million limit is much higher than most drivers — even taxi drivers in many major cities — carry in liability coverage. If you’re in an accident caused by a driver with not enough or no insurance, Uber’s insurance policy will cover your damage and injuries up to $1 million. If an uninsured or underinsured driver hits you while driving for Lyft, the amount its policy covers varies by state. You can also draw on comprehensive and collision coverage from the ridesharing companies, but only if you also have such coverage on your personal policy. Beware, though: Deductibles can be high, and the policies apply only once you’ve accepted a ride request or while you’re carrying passengers. If you cause an accident during Period 1, you’ll need to file a claim with your insurance provider unless your state law or rideshare insurance policy specifies otherwise. If the claim is denied or you’re not fully reimbursed, Lyft’s or Uber’s insurance will kick in. But ridesharing companies’ limits in these cases are relatively low — this is the “gap” that rideshare insurance from your personal carrier is designed to cover. Call the police. Whether or not your car accident happens while ridesharing, your first step should be to call the police. Depending on the type of accident and your rideshare company’s rules, you might have to provide your personal proof of insurance or the rideshare company’s certificate. Exchange information with the other driver as you normally would. How to file. Next, inform your personal auto insurer and find out if you need to file a claim. Even if you can rely on Lyft or Uber to cover your damage, your personal insurer will find out about any accidents, and it’s best they hear it from you. Drivers who haven’t been honest about their driving status can find themselves in a tough situation: If you choose not to tell your insurer, you risk being dropped. Finally, notify your ridesharing company as well. If you can take advantage of the company’s coverage, a representative can help you start the claims process. Rideshare insurance has gaps. 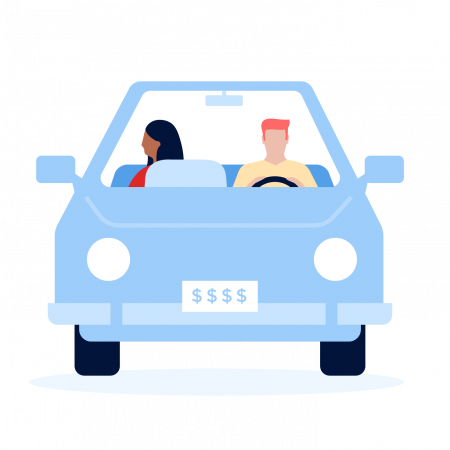 Rideshare companies offer full insurance coverage after you’ve accepted a ride request and while you’re driving passengers, but coverage is skimpier while you’re waiting for a request. You probably need a rideshare policy. Rideshare drivers should look at what's covered in both their personal car insurance policies and the rideshare company's insurance. To be fully covered, you’ll probably need either rideshare insurance or a commercial auto policy. Availability is spotty. Not all insurance companies offer rideshare insurance policies, nor is coverage available in all states. If you can’t get it, you'll need to buy a commercial auto policy to be properly insured. You may risk your personal coverage. Even if your rideshare company offers full coverage during all phases of the job — before, during and after ride requests — your personal auto insurer could drop you if you don’t disclose you’re a rideshare driver.